Ever wonder what green eggs and ham really taste like? They're yummy. And now everyone can whip up a batch for themselves using this fabulous cookbook. 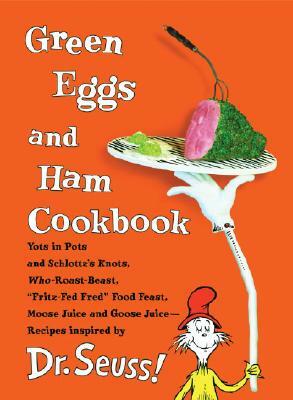 Filled with simple, scrumptious, wacky recipes for such foods as Cat in the Hat Pudding and Moose Juice and Schlopp, this unique cookbook will have the whole family hamming it up in the kitchen. Each recipe is accompanied by the original verse that inspired it, and the pages are laminated to protect against getting splatters of Sneetch Salad, Oobleck, and Solla Sollew Stew. Georgeanne Brennan is an award-winning cookbook author and journalist. Her expertise in all things related to food and gastronomy ranges from farming and agriculture to history and food lore. Her cookbook, Aperitif: Recipes for Simple Pleasures in the French Style, won the Julia Child Cookbook Award in 1998. Ms. Brennan was educated at San Diego State University, the University of California and the University of Aix-Marseille in Provence, France, the village that would be the inspiration for her memoir-cookbook, The Food and the Flavors of Haute Provence, winner of the 1998 James Beard Cookbook Award. Ms. Brennan currently resides with her husband on a small farm in Northern California near Davis. They have four children. The author lives in Northern California.